Edited by Vid, 17 April 2012 - 06:58 PM. millions of michael are coming? Edited by Wt_know, 07 February 2019 - 03:16 PM. Millions of michael can come to sg if only the garment welcome them lo. Thing is garment of sg unlimited and free flow welcome anyone who wants to come here?! Edited by Staff69, 07 February 2019 - 04:57 PM. 1997 don't have ability to migrate and so now kpkb? There are many hk people come here to work? We have created an environment that are ideal for the rich and foreigners at the cost of her citizens. While i can understand we have no natural resources and need foriegn funds and investments, we also don't want to end up being high class salves paying top money to people so that they could also ennoy this fruits. Who open the gates for them? Edited by Fcw75, 09 February 2019 - 05:10 PM. 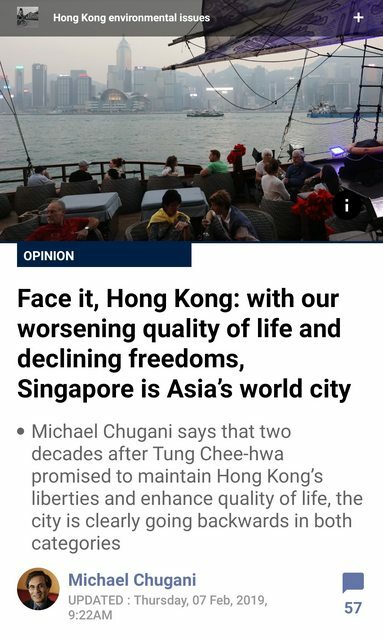 Based on the values that Asians have, Singapore should indeed be the best. Can find work or do business easily, large spaces for housing, education, safety etc etc. It’s just a bit small for an economy. And it’s also not the ideal place if one adopts European, UK or US values.